All buildings and major equipment are in place at the 65 MMgy Dakota Spirit AgEnergy under construction in Spiritwood, North Dakota. Staff set to move into offices in mid-January and begin preparing for startup. A Michigan ethanol plant has had success with its Yellow Hose program, blending E85 and supplying 33 area retailers, as well as sales at an on-site fuel pump. For 15 months the plant has held a $1 spread between E85 and gasoline. 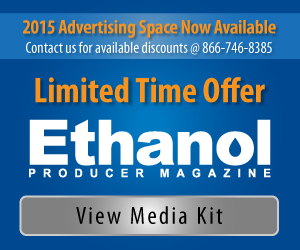 The sale of a 21 MMgy corn-ethanol plant closed on Dec. 23. Green Biologics Inc. plans to continue ethanol production until sometime in 2016, when it will transition to n-butanol and acetone. Data recently released by the U.S. Energy Information Administration shows the U.S. ethanol industry started out the last month of the year with two record-setting weeks of production, with a new record set the week ending Dec. 12. On Dec. 19, President Obama signed a bill that retroactively extends several tax incentives that expired at the end of 2013 and throughout this year through the end of 2014, including several incentives that benefit biofuel and bioenergy producers. Syngenta has announced that it has received the safety certificate for its Agrisure Viptera trait (event MIR162) from China's regulatory authorities, formally granting import approval. The approval covers corn grain and processing byproducts. Southwest Iowa Renewable Energy LLC announced it had paid in full the outstanding convertible subordinated debt held by the company's strategic partners, Bunge North America Inc. and ICM Investments LLC. FAS GAIN report highlights the current state of the biofuels industry. Canadian ethanol production to increase 1 percent in 2014, reaching 1.75 billion liters. U.S. imports of 2 billion liters needed to meet mandates. USDA long-term projections call for slightly lower corn acres to be planted over the next decade while corn yields steadily climb. The USDA will release the complete long-term supply, use and prices projections to 2024 in February. Nominations due Jan. 30 for the U.S. EPA's new Science Advisory Board Agricultural Science Committee, established in the 2014 Farm Bill to advise EPA on matters impacting farming and agriculture-related industries. The U.S. Department of Energy's Bioenergy Technologies Office recently released an updated multi-year program plan (MYPP), which sets for goals and structure for the office over the next five years. The U.S. EPA has published a notice in the Federal Register requesting substantiations of confidentiality claims from businesses that have submitted reports and transactional information on the renewable fuels standard (RFS). At a grand opening in early December, Ottawa County, Michigan, announced the official kickoff of the Great Lakes AgTech Business Incubator, a nonprofit helping farmers and entrepreneurs turn their ideas and inventions into successful businesses. The U.S. Navy, Naval Air Systems Command (NAVAIR) and Gevo, Inc. have announced the first successful alcohol-to-jet (ATJ) supersonic flight at the Naval Air Warfare Center in Patuxent River, Maryland.